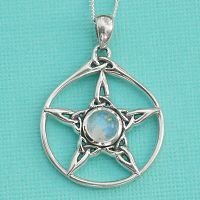 - Each arm of the star is a three-point Celtic knot, and set in the center is a rainbow moonstone cabochon. Now, if you've never seen a rainbow moonstone in person, I can only say that pictures, no matter how detailed, can't possibly capture the flashes of color this stone reveals as it is turned in the light. It is nothing short of magical! Approximately 7/8" in diameter. Includes 18" Sterling Silver chain. 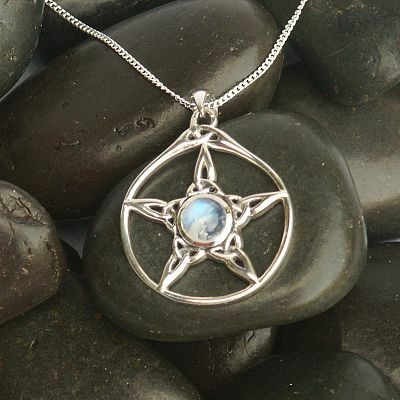 Do you have any other questions about our Silver Moonstone Triquetra Pentacle Pendant? Please add 5 Stars to my review. This pendant has become one of my favorite pieces to wear.It's a stunning pentacle! Beautiful on the site but lovelier in person! I got this as a gift for my birthday. Five years later, it's the only piece other than my wedding ring that I constantly wear. It's beautiful, the moonstone itself has a gorgeous blue hue. It is pretty and a bit more discreet in design. Oh, my god, I *love* this pendant! I just got it tonight and I'm wearing it with my pajamas. ;-) It just feels good to have on. There's an energy to it. When I first saw it, months and months ago, it just really spoke to me. I've looked at probably hundreds since that time, but always kept thinking about this one. I had put it on my Christmas list, and my husband thought about getting it for me, but it was out of stock. Well, shortly after Christmas, I really felt the need for some sort of psychic protection. I am not a Pagan, mind you, but I do subscribe to basic Pagan beliefs. And when somebody asked me why not wear some sort of combination of the Star of David and a Christian cross (my mother was Jewish, my father Protestant) I began to wonder what type of symbol would define *my* beliefs. That's when I started browsing Pentagrams. So when I felt this need for this psychic protection, I looked up the meaning of a pentagram and was reminded: top point = light or spirit, side points = the four elements. I've been an intuitive most of my life. This speaks. Now that I have it, I cannot tell you how much energy it seems to be embued with. I'm sure it would be different for different people, but there just seems to be something about it. The combination of the Triquetra with the Pentacle probably doesn't hurt. Okay, okay, so you just want a pretty necklace. It's that too. ;-) Well worth the money ... and the wait. This is a beautiful pendant!! The rainbow moonstone is breathtaking. Very sizable too.